Art therapy practice requires knowledge and skills in usage of visual art and the creative process, as well as application of theories and techniques of human development, psychology, and counseling. A master’s degree (MA, MAAT, MS) is the minimum education required to practice art therapy. An undergraduate degree in psychology (BS), or art (BA, BFA), are most commonly completed as preparation for admission into an art therapy graduate program, which must include a specific number of prerequisite credits in various content areas. Educational standards for approved art therapy graduate programs are overseen by the AATA’s Educational Programs Approval Board (EPAB). Notre Dame University of Maryland has launched an Art Therapy BA/MA program in Baltimore, and we couldn't be more thrilled! The Art Therapy program introduces concepts for one of the newest specializations within the helping professions. Designed to prepare students to pursue a master's degree in order to meet the requirements for licensure, the interdisciplinary curriculum integrates knowledge of the visual arts, human development, psychological theories and counseling techniques. The Master of Art in Art Therapy program dives into advanced courses in counseling and therapeutic techniques with an emphasis on art therapy as a unique psychotherapeutic practice, as well as advanced courses in painting, ceramics, sculpture, and photography. Anyone interested in learning more about the graduate and undergraduate programs including admission requirements at NDMU, are encouraged to contact Program Director Cathy Goucher, at cgoucher@ndm.edu. 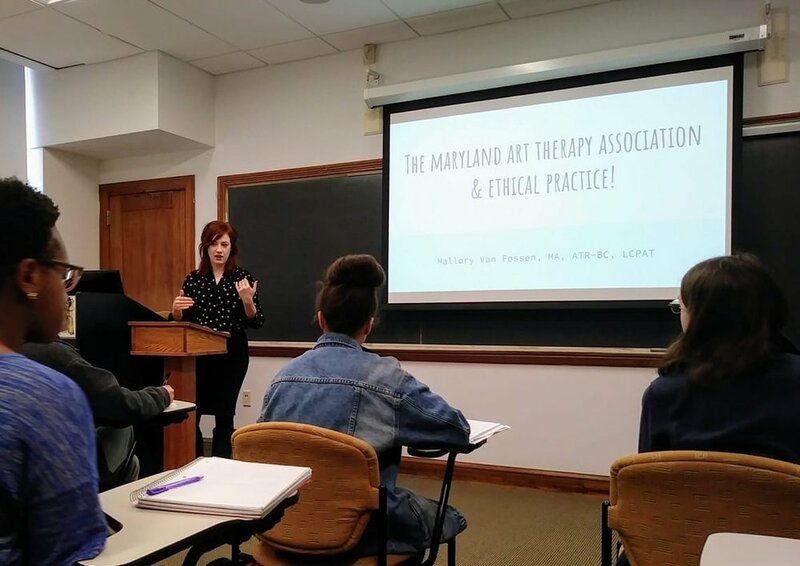 (Right) MATA president, Mallory Van Fossen is seen discussing ethics with the first undergraduate students studying art therapy at Notre Dame of Maryland University. Saint Mary-Of-The-Woods College (St. Mary-Of-The-Woods, IN) Offering the only EPAB approved Master of Arts in Art Therapy online graduate degree program. For more information about undergraduate preparation for admission into an art therapy graduate program, please see The American Art Therapy Association, Becoming an Art Therapist. For a full list of programs in the United States, see EPAB Currently Approved Graduate Programs. Please remember, a passing score on the Art Therapy Board Examination as well as Maryland State Licensure are also required in order to practice art therapy in Maryland, after successful completion of the outlined educational requirements.